The Carolina Panthers traded a conservative, home-grown owner for a Hillary-loving hedge fund type from the northeast. The new guy has made it clear he’s not interested in building goodwill with the natives down here. Jerry Richardson was a no-nonsense conservative-leaning guy. That image clashed with the SJWs who now control the NFL and much of the media. So, he got hounded out of the league and the top job at the team he founded. 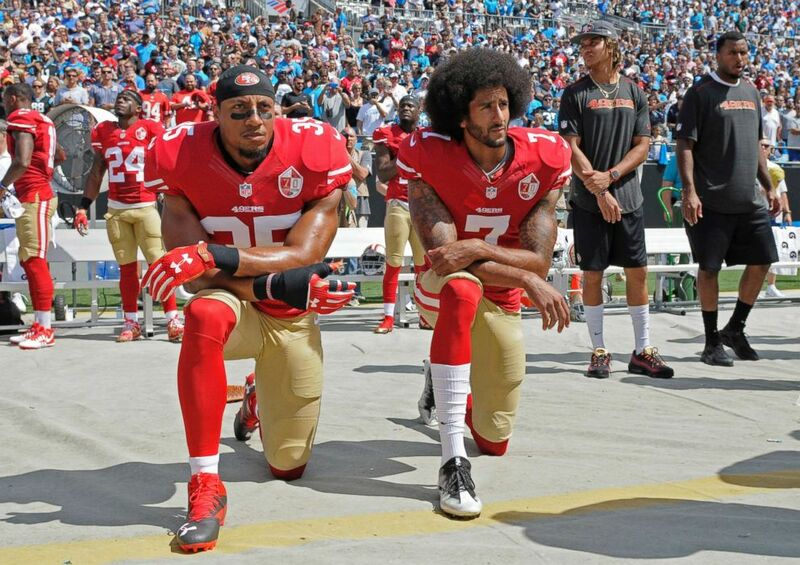 Former 49er Eric Reid was the first player to join Colin Kaepernick in his anthem protests, during the 2016 season. 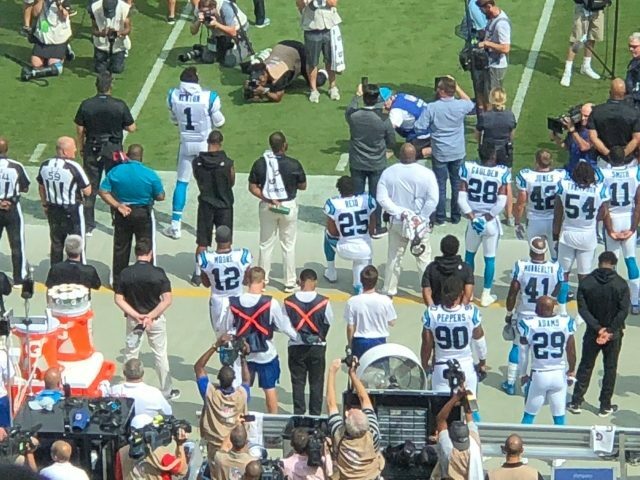 After a long layoff, many wondered whether Reid would continue those protests in his debut with the Carolina Panthers. Well, on Sunday afternoon, we got our answer. In March, the former 49ers safety became a free agent and when he was unable to find a new team, he followed Kaepernick’s lead and filed a collusion lawsuit against the NFL, which is still ongoing. Reid had been the best available safety on the open market, until the Panthers signed him at the end of September. In his first press conference with the Panthers, Reid said the Panthers did not ask him if he would protest before signing him. He also said hadn’t made up his mind on if he would demonstrate before the game or not. Apparently, Reid found those “other ways” unappealing. 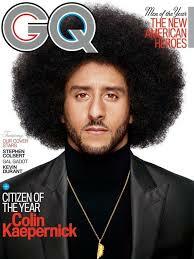 So now, Charlotte is, um, blessed with Kaepernick’s homey. Big Jerry would have soooooo wrung this guy’s neck if he tried something like this under his rule. Heck, I’m not sure Richardson would have OKed drafting him. I don’t watch the NFL like I used to. The days of guys like Sonny Jurgensen, Joe Montana, Walter Payton, John Riggins, Archie Manning, Gayle Sayers, and Art Monk — who showed respect for their fans and loyalty to their towns — are long gone. Those guys have been replaced with a bunch of wanna-be gangsta rappers who make eight figures a year, date supermodels, own multiple multi-million dollar homes, party with Jay-Z and Beyonce and think they are oppressed. You’re more likely to find one of those on an NFL roster these days than you are to find a Pat Tillman, Alejandro Villanueva, Bryce Fisher, Roger Staubach, or Rocky Bleier. 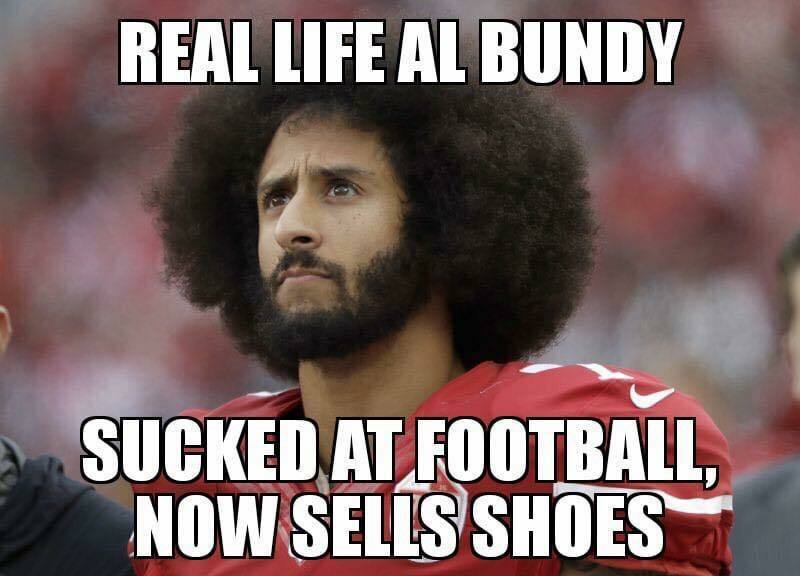 I don’t watch NFL anymore. PERIOD. Overpaid thugs. Better things to do. I had really only watched the Panthers for years and years then once Crapernick started his thing I tailed off watching them very much. This year I had watched maybe one quarter’s worth of plays but now that i know this is being allowed I can and will easily just cut them out entirely. I did not really like the way the railroaded Richardson and forced him to sell and installed that leftist guy anyway. Bye bye Panthers. Richardson was a no-nonsense conservative-leaning guy? I guess so if that means he harassed a female employee, it is consistent.